I am a huge fan of mashed potatoes! They are nice and light and fluffy and so addictively good even when flavoured simply with milk and butter. A while ago I had come across the concept of mashed white beans in the form of this recipe for mashed white beans with spinach and olives on Choosy Beggars . I was immediately intrigued by the idea of mashed white beans and the flavours in this recipe were right down my alley! Recently I have been trying to go for some lighter and healthier dishes and it seemed like the perfect time to try some mashed beans. These mashed beans are pretty easy to make and for the most part the ingredients will come from your pantry. If you have any fresh herbs lingering in your fridge that need using this dish is perfect for using them up but if you don’t have them then dried are good as well. The mashed white beans certainly were packed with flavour and oh the aroma! All of the herbs in the beans quickly filled my apartment with the most amazingly aromas and they really took this dish over the edge. Every time I entered my apartment for the next while, I caught a whiff of those herbs and I was immediately craving a bowl of the mashed beans! Even with all of the flavours and the aromas, I have to say that my favorite part of this dish was how creamy the mashed beans were. They definitely give mashed potatoes a run for they money. Add the onion and saute until lightly golden brown, about 10-12 minutes. Add the broth, beans, herbs, salt and pepper and simmer. covered, until the beans start to break down, about 20 minutes. Remove the herbs and mash half of the beans. Add as much broth as needed to get the beans to your desired consistency. Mix in the olives and the spinach. Cook until the spinach just wilts, remove from heat and hit it with a splash of lemon juice. Love the mix on this recipe – it's like a meditteranean bible come to life. Sounds like a definite winner! have I told you I love you?! Mashed white beans sound even better than mashed potatoes even though I'm a big fan of the latter too. This recipe sounds really delicious. I can't wait to try it. Sooo healthy too! So fantastic-looking! And packed with healthy ingredients. What an awesome spread u have in ur blog!!! Now glad to be following u…!!! This sounds so flavorful with all the different herbs and olives. Mashed white beans are so much better for you than regular potatoes too, and I love the spinach in the dish. What an intriguing and different dish! I love all the ingredients and the end result is beautiful with all that green. Looks delicious, full of flavor and very healthy! Kevin, so glad that you enjoyed this dish!! Yours looks delicious and photographed much better than mine did. 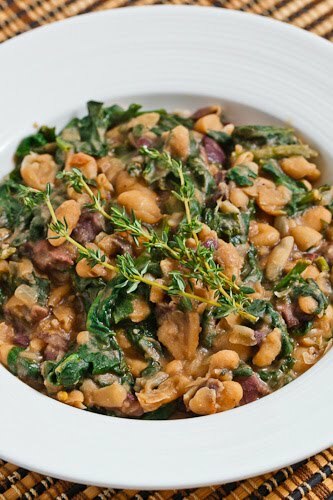 Hey, it must be braised white bean season….someone else posted it today too! oh, my this looks so good! perfect for a winter meal!!! I will add this to my list of must cook list!! This dish is full of protien and flavour. What a great idea for a vegetarian dish. Nice photo and an interesting bean recipe!! Marvelous symphony of flavors Kevin! This post really caught my eye … and my appetite! Fantastic! This is being added to the very long list of must make recipes. It is going to the top, however! Oooh yum – a great idea! I had some mashed white beans in a restaurant the other day that had me literally swooning! Love the spinach and olive add-ins here! Oh wow this looks so delicious and healthy. Lovely ingredients. Mmmm….nothing not to love about this recipe!! I made this last night, and even though I forgot to buy an onion for the recipe, didn't have any rosemary on hand, and used veggie broth, it was absolutely wonderful! An easy-peasy dish and another delish vegetarian meal. Thanks! I'm going to try and give this recipe a try tonight. I think it might be a good way to get my kids to eat spinach! Now this is my kind of dish! Healthy and gorgeous!! This sounds great Kevin. It has all my favorite things, can’t wait to try it. Also keep those emails coming, love getting them.